Hey all! As you all know, I’ve spent the summer in Edinburgh and not back home in Staffordshire. My parents came up to Ed for a week, I’ve had lots of fun at the Edinburgh Fringe Festival (which I’ll do a post on very soon) and I wasn’t planning on going back home. So how did I find myself alone on a platform, awaiting my second train you ask? Well, that’s a combination of running out of money (the rent is paid and my student loans don’t start until the end of September), missing my parents and Nanna (and my dogs) more than I thought I would, boredom, and the fact that my best friend Rach is home until the end of September and I didn’t get to see her before I left Staffs in July. We’re very excited to be seeing each other again. Very. She goes to university in Wales and I am obviously in Edinburgh, so I think the last time we saw each other was Christmas (potentially Easter, my memory is awfully bad at times). IT HAS BEEN FAR TOO LONG. So here I am. I’ll be back in Staffs for a little over a week, and return to Ed next Friday. Then soon enough uni will be starting again. I’m ridiculously excited to be starting second year. I usually buy food on the train, but this time I ate before u left and just brought snacks for the train. I got 2 boxes of watermelon slices, a bag of rocket (one of only leaves I eat in salads – the other being lambs lettuce) and a bag of apples. Fun, huh? 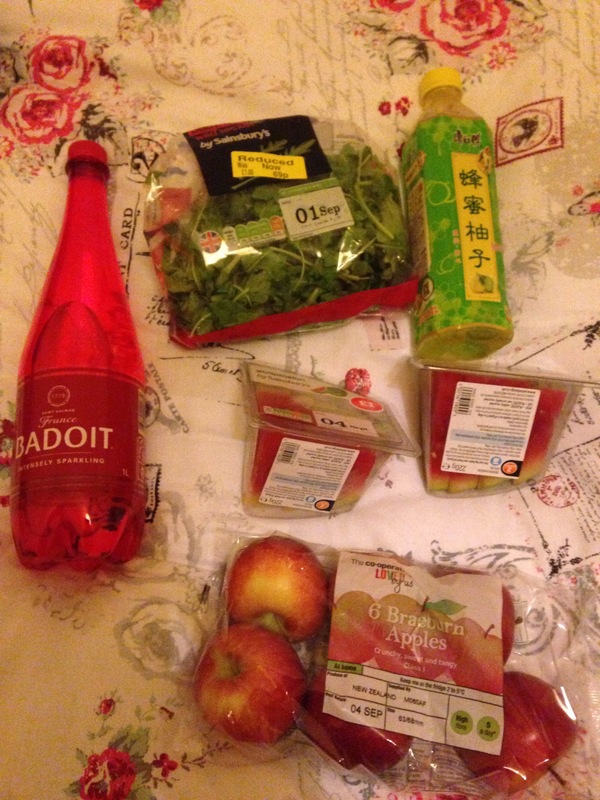 I also got a massive bottle of sparkling water and a bottle of pomelo honey iced tea from my local Chinese supermarket in Ed. it’s lovely!!! I highly recommend you pick up a bottle if you ever see it – there’s lots of different ones to try. I tend to favour the ones with honey, as I find it makes the drink a touch sweeter. Of course you could add any kind of syrup or sweetener if you wanted to. 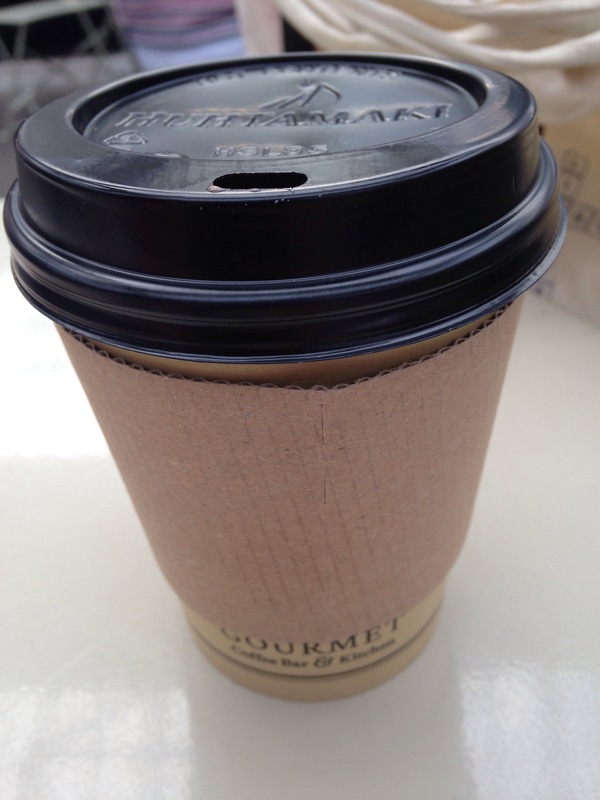 I also bought a hot chocolate at the station just now, while waiting for the second train. I usually have hot chocolate with caramel syrup, but as luck would have it my train was late in and the caramel had sold out. The guy recommended hazelnut instead and, although I don’t particularly like nuts, it did make a very nice hot chocolate. Basically melted Nutella which is ALWAYS good. I don’t have much planned for this week, apart from seeing family and Rach, but I’m sure something fun will come up. Until then! 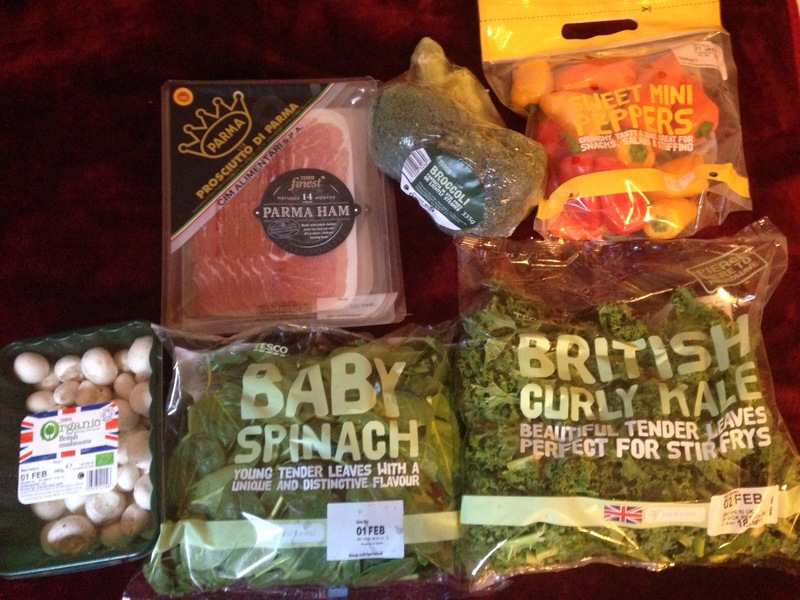 Tesco Healthy Food Weekly Shop! Hey guys! 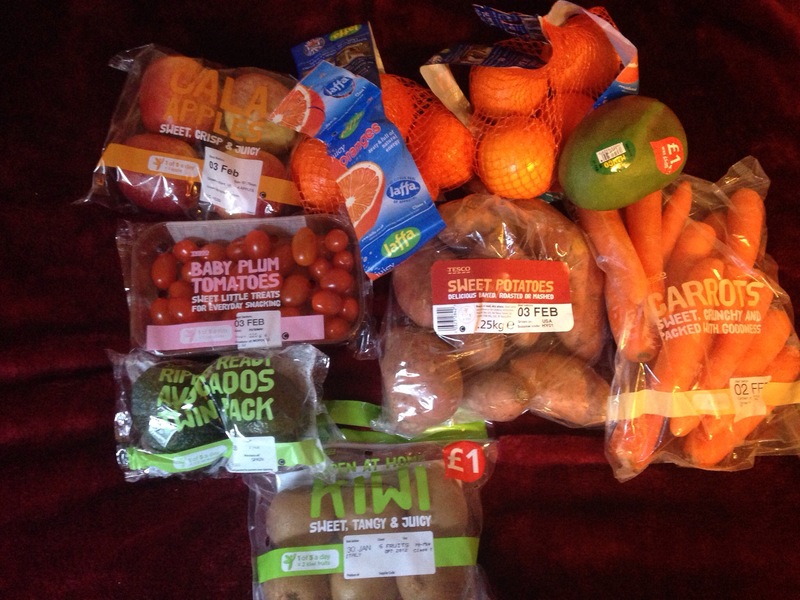 I’ve been trying to eat more healthy food and a bit less fast/convenient stuff, so I thought I’d do a quick post on the fruits and veggies I picked up from Tesco today. I usually do a main shop per week, and then pick up other things as and when I need them, so I’ll also put how long I think the food will last me before I need to top up my supply. Enjoy! Parma Ham – I’ve been trying not to eat so much meat recently, so this pack of Parma ham is the only meat product I picked up today. It’ll probably last me a couple of days as snacks. Broccoli – I picked the biggest broccoli they had. I don’t eat it everyday so I won’t have to buy more this week. Baby Sweet Peppers – this big bag of peppers was really good value. I eat these with lunch and also as snacks so I’ll eat them up in a couple of days. I might have to go bag and get a few more bags while they are on offer. Curly Kale and Baby Spinach – you need plenty of greens and kale and spinach are cheap but nutritious and delicious! I won’t eat them at the same time so both bags together should last me a few days. Baby Button Mushrooms – I picked the mushrooms that were the highest weight in the price band. These too will last me a few days. Apples – I don’t eat too many apples but they’re good for you and good snacks. These will easily last the week. 2 bags of oranges – I love oranges, so I’ll get through these pretty quickly (two or three per day). These were on sale, and they’re very juicy and delicious. Mango – mangoes are another fruit love of mine, but I don’t usually buy them from Tesco because they’re a bit expensive. However, they were on sale today so I picked one up. Carrots – carrots are great snacks or in salads/with lunch. These will easily last me the week, as it’s a pretty big bag. Sweet Potatoes – I love sweet potatoes far more than normal ones. I’ll have these as jacket potatoes, or maybe roast them. These too will last for the week. Kiwi Fruits – I bought a bag of ready to eat kiwi fruits. These are lovely is salads or as a snack, so I may have to buy more in a few days. 2 Avocados – I usually buy avocados from Lidl as they tend to be quite a bit cheaper, but this twin pack was pretty good value, so I picked them up. I don’t eat avocado everyday, and I don’t buy them every week either, so these will last quite a while. Baby Plum Tomatoes – I love snacking on tomatoes, so I tend to buy a pack every couple of days. These little ones are really sweet and good value. Hey everyone! Today I decided to make myself some lunch instead of buying a sandwich – I’m trying to save some money AND get healthier. So I made this lovely little lunchbox. You can have it for lunch like I did, or as a snack, but it’s quick and easy to make, healthy and yummy! 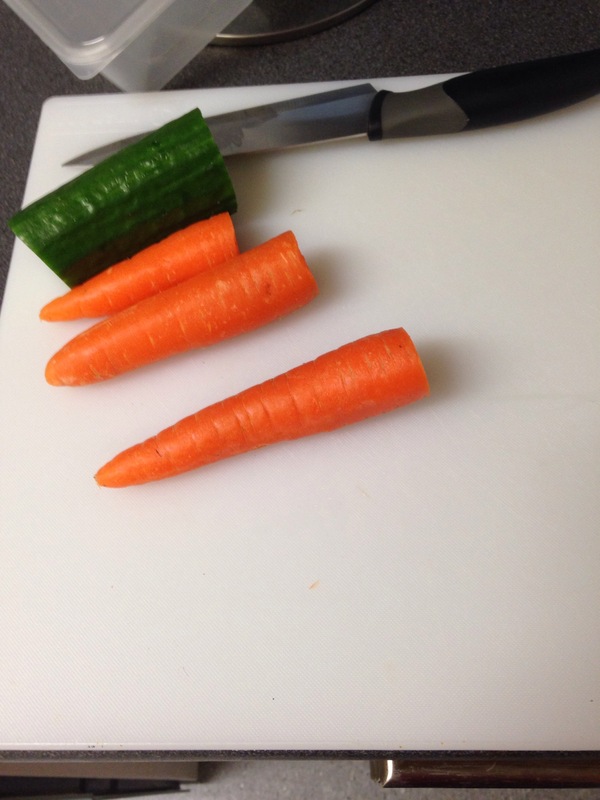 First, wash and dry some carrots and cucumber. You can buy pre-chopped or baby carrots, but I only had “normal” ones. Cut your veggies into sticks. You could always try adding red or yellow peppers, tomatoes or radish slices for some added colour. 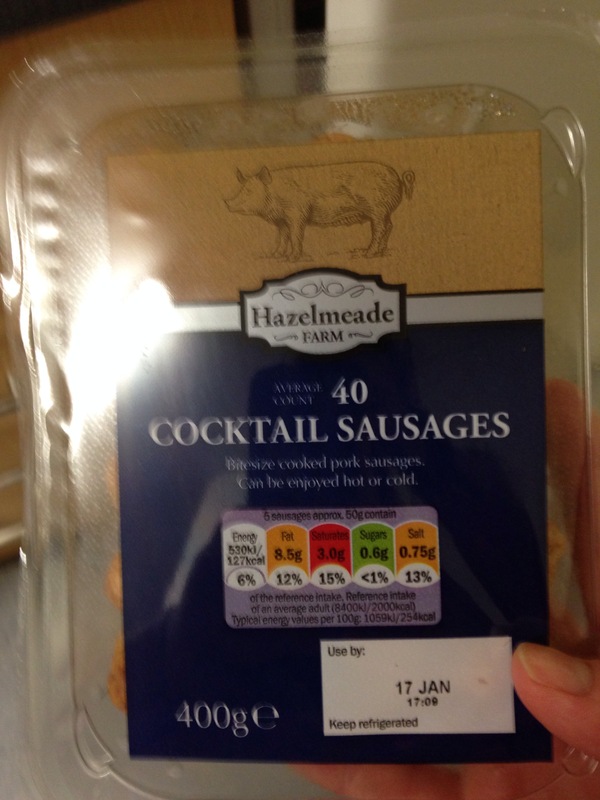 Then, get around 10 cocktail sausages – the pre cooked, ready to eat ones. 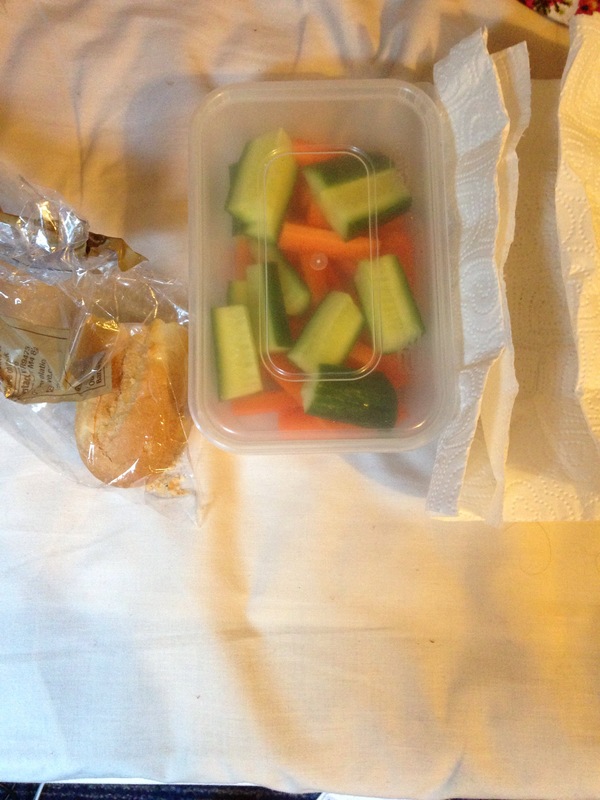 Then place your veggies into a lunchbox or container. 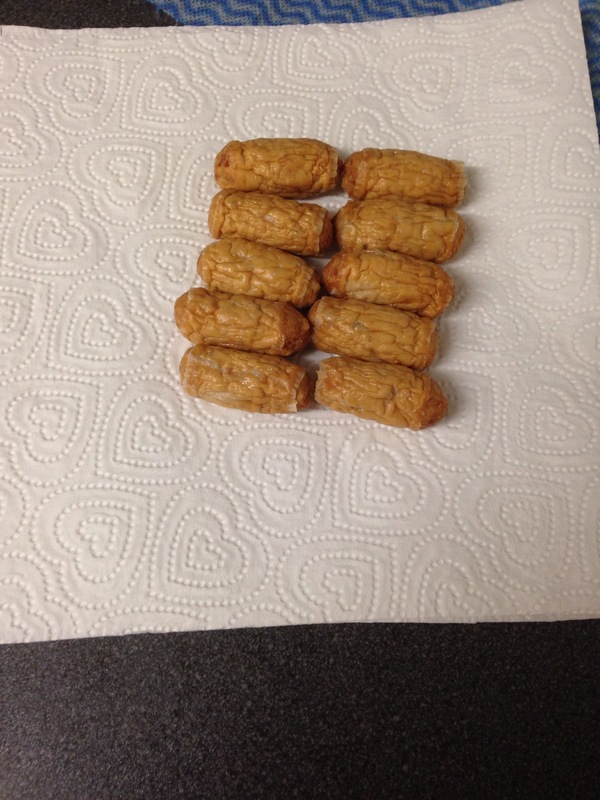 I didn’t want the sausages to get soggy or anything, so I wrapped them up in a little kitchen towel first. Then, I added a nice chunk of French Stick (you could swap this for rice cakes, crisp breads, ryvita, crackers, a bread roll or anything else that takes your fancy). And that’s it! Told you it was easy! This took me less than 10 minutes to put together, and was satisfying without being heavy. It was at least 1 of my 5 a day too! 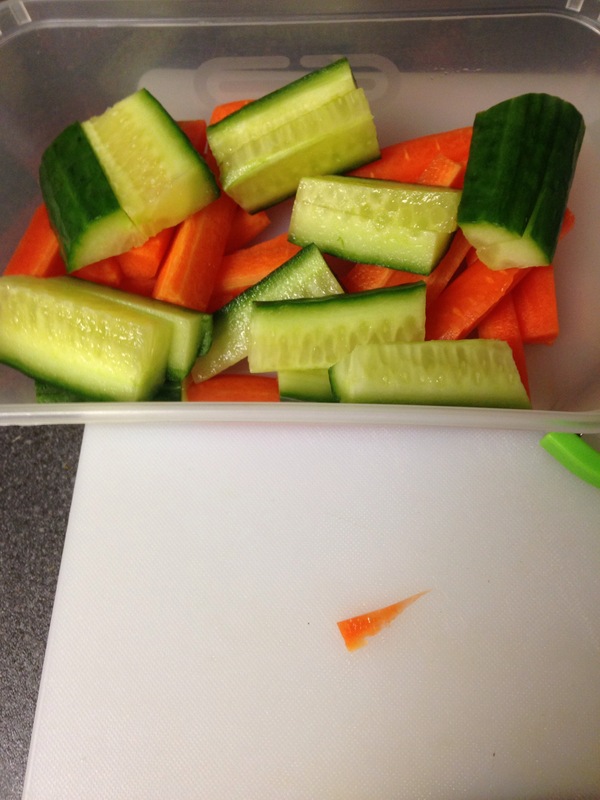 Try it out as a quick lunch or snack – and if you have any other cheap, quick snack ideas please let me know!